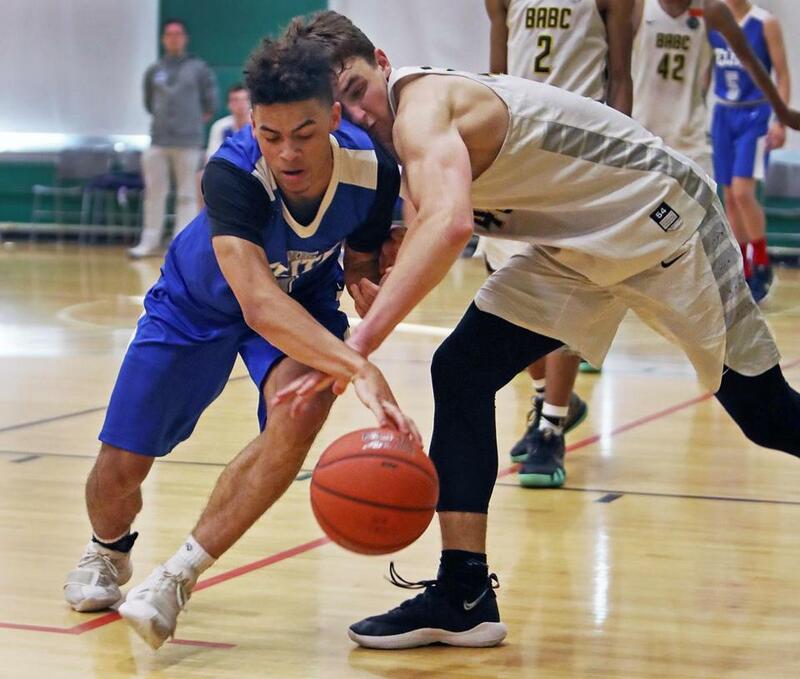 Northeast Elite&apos;s Evan Gray (left) and BABC&apos;s Matt Cross (right) battle for a second-half loose ball in the Boston Shootout. At first glance, Mitchell and Shea Doherty certainly look the part as brothers. They share the same last name, buttery-blond hair, and quiet swagger up and down the court for their BABC Elite Youth Basketball League teams. Both play the same forward position with massive 6-foot-7-inch frames. However, Mitchell and Shea showcased contrasting games at the 2018 Boston Shootout at Cathedral High School on Sunday afternoon. “Mitchell is a lot different than his younger brother,” said BABC Junior coach Leo Papile. “[Shea] plays elbows-over-the-rim much like his dad, Russell, did. Both brothers take after their father, Russell Doherty, who played basketball at Boston College in the early 1980s. Fifteen-year-old Shea led the BABC Freshmen to a 70-53 victory over the Albany City Rocks in the freshmen finale. He ended his game with 12 points, 7 rebounds, 4 assists, and 2 blocks. Older brother Mitchell, a captain for the BABC Juniors, led his team to a 64-49 victory over Northeast Elite in the junior finale. He filled out the scorecard with 15 points, 5 rebounds, 4 assists, and 4 steals. “[Shea]’s got a lot of training from his older brother Mitchell,” said BABC Freshman coach Britney Papile. “The real Shea Doherty is going to take a three, make it or miss it, and then crash the rim on the miss. While both coaches marveled at Shea’s high ceiling as a shooter, they know his game needs some fundamental polishing before making the Division 1 leap. Mitchell and his savvy basketball IQ serve as a role model for Shea, who looks forward to his sophomore season at Acton-Boxboro High next season. Mitchell has offers from Division 1 programs Albany, Hartford, UMass, and Duquesne. Apponequet 5, Seekonk 0 — Junior Colin Fahey pitched a one-hitter with six strikeouts to propel the Lakers (18-2). Whittier 7, Greater Lawrence 4 — Sophomore Joey Santiago had three RBIs and senior Will Carpenter had 12 strikeouts in 6⅔ innings to lead the Wildcats (16-2) to a Commonwealth Athletic Conference Upper Division title. Norton 5, Braintree 0 — Kelly Nelson tossed a no-hitter, allowing just two walks for the Lancers (19-1). Norwell 15, St. John Paul II 1 — Murphy McDonough, Maddie McDonough, and Lily Warendorf each notched three goals for the Cippers (17-3). Because of wet weather in the forecast, the MIAA North/Central/West girls’ golf sectional tournament scheduled for Monday at Townsend Ridge CC has been postponed until June 11. The South sectional tournament is scheduled for Tuesday at Ridder Farm GC in East Bridgewater.